It is official, the Chinatrust Financial Holding lead by 辜仲諒 (Jeffrey Koo Jr) is going run the CTBA. Koo and his associates have successfully gained control of the CTBA board by being the majority after the general election on May 19, 2017. 53-year-old Jeffrey Koo Jr is expected to be inaugurated as the new CTBA President on June 29, and to start a four-year term until 2022. A lot of company and organisation names are extremely long when translated to English. Therefore, for the ease of reading, here are some of the terms we will be using throughout this blog post. Quick Refresher on CTBA: Why Hated by so Many? So, what is the CTBA? Here is a quick refresher. The CTBA is a private organisation that managed the amateur baseball in Taiwan. With the CTBA being the only governing body for baseball in Taiwan, they also control the Taiwanese national baseball team from the senior level, down to the student level. Over the years, the poorly managed organisation received countless public criticisms over their way of mistreating players and for not being transparent with the government funding. 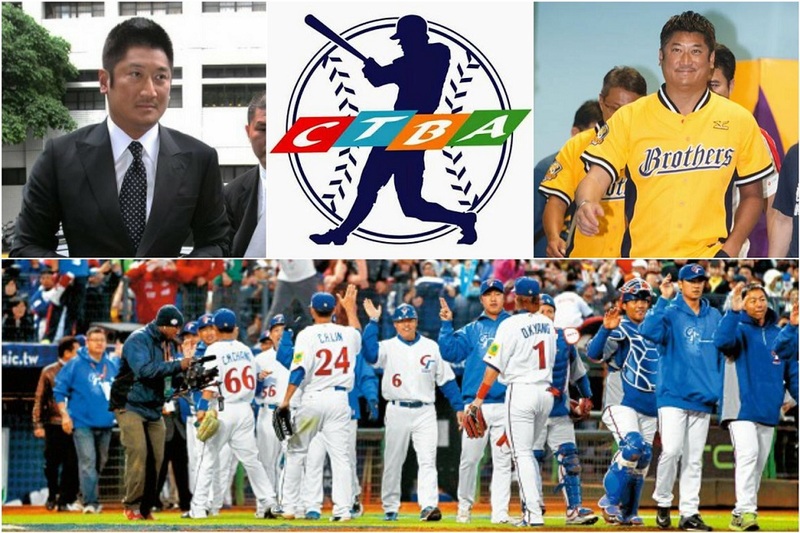 Instead of putting Taiwan baseball development as their priority, the CTBA has been used solely as a vessel for politicians and businessman to further their political and personal gains. 辜仲諒 (Jeffrey Koo Jr), a major shareholder of the Chinatrust Financial Holding will replace 廖正井 (Liao Cheng-Ching) as the new CTBA President. While 8 out of 13 the supposed independent director positions are filled with people affiliated with the Chinatrust Financial Holding. It is also worth mentioning that the newly elected CTBA President Jeffrey Koo Jr is also the owner of the Chinatrust Brothers, one of the four teams in Taiwan’s Chinese Professional Baseball League (CPBL). 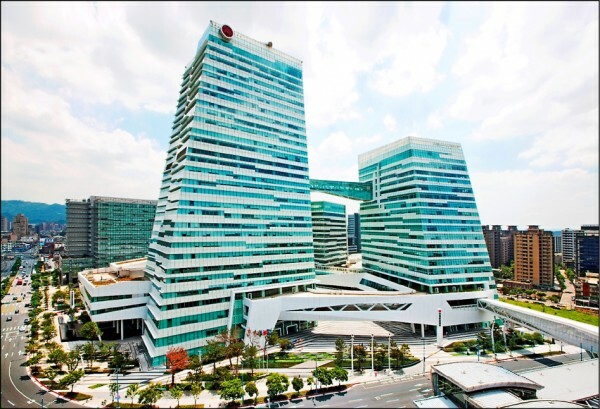 With the Chinatrust Financial being one of the largest financial institutes in Taiwan. Ideally, the CTBA will now have much better access to the necessary resources. 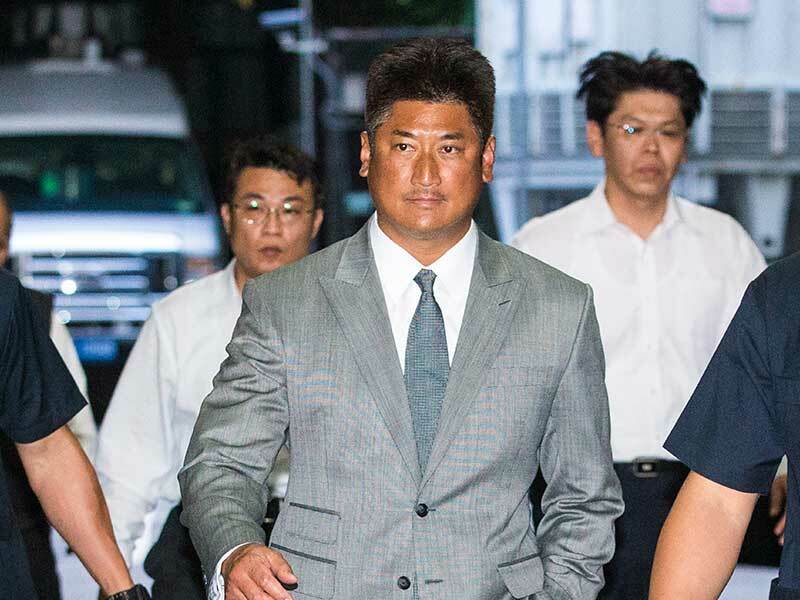 Despite his not so ethical business background, Jeffrey Koo Jr, the new president of the CTBA is a die-hard baseball fan with a real passion for baseball. For the past several years, Koo’s Chinatrust Charity Foundation has sponsored numerous student baseball events. The charity also provided financial and coaching support to those student baseball teams that do not have enough funding. With Koo also being the owner of a CPBL team, the Chinatrust Brothers. Potentially, he can act as a mediator to end the longtime feud between the CPBL and the CTBA. Less political driven in-fighting and more focused energy on making Taiwan baseball better is always a good thing. After all, isn’t this is what the CTBA is all about as an organisation? 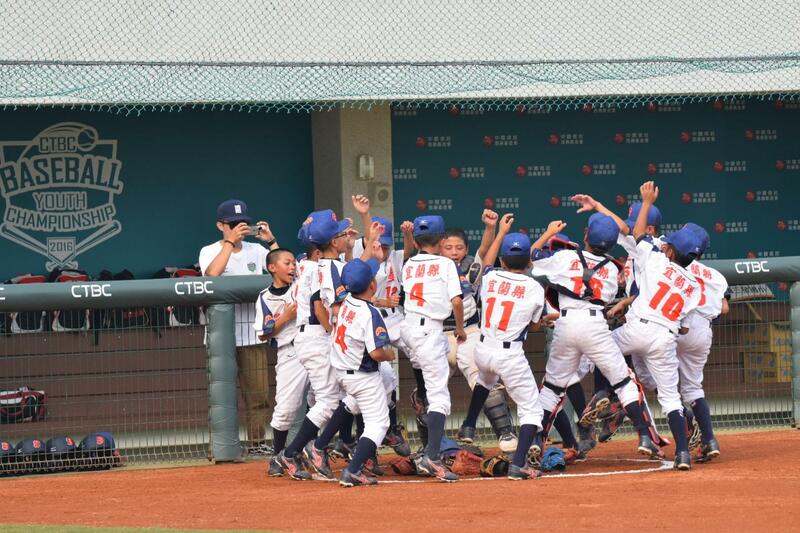 To make Taiwan baseball environment better for the next generation? Looking at the formation of the new CTBA board, the lack of independent voices on the board is a major concern. As stated earlier, 8 out of 13 supposedly independent directors are affiliated with the Chinatrust Financial Holding. Despite the Taiwan Baseball Reform Alliance (台灣棒球改革聯盟) had a presence in the general election, both candidates were not elected due to the alleged vote allocation tactic by the Chinatrust Financial Holding. Judging from the list of newly elected board of directors (30) and the board of supervisor (9). It is pretty clear that nothing has changed, it is the same board of directors and supervisors from the previous CTBA board. Only three new directors got elected this year, while the remaining 27 directors are all either from the previous CTBA board or have an affiliation with the Chinatrust Financial Holding. The chart below is the comparison of 2018 vs 2014 CTBA board. Names highlighted in red means they are from the 2014 board. The names highlighted with yellow means they are affiliated with the Chinatrust Financial Holding. This brings the real question, what can people expect from the CTBA, when it is essentially still the same group of people running the show. Sure, there are a few new people becomes the directors, but they are all affiliated with the Chinatrust Financial Holding. 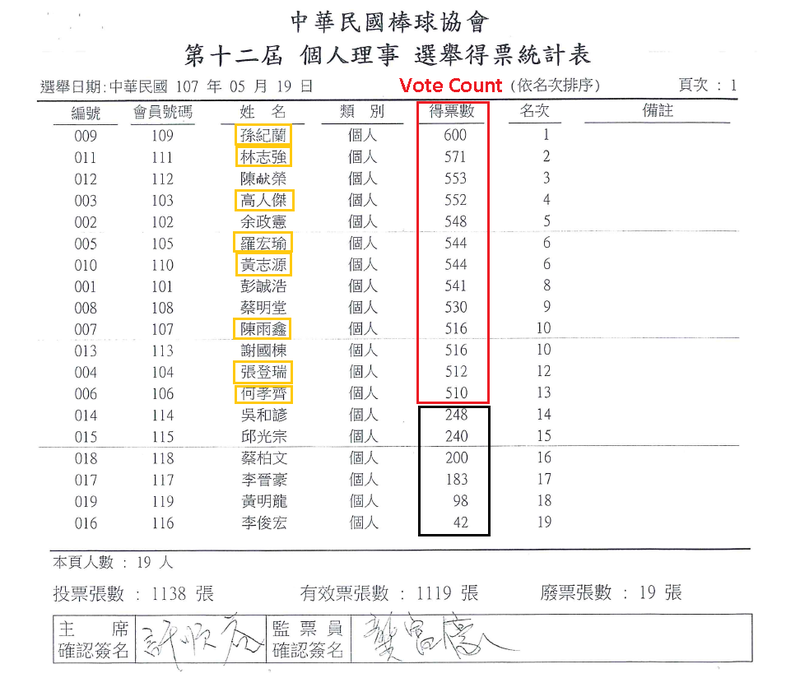 Leading up the CTBA general election, there were plenty of evidences of vote allocation done by the Chinatrust Financial. However, the Sports Administration have decided not to investigate it further, stating it is all within the rule of the general election. According to the leaked document, the Taiwan Life Insurance, a subsidiary company of the CTBC have asked its employees to give 高人傑 (Kao Jen-Chieh) the power of attorney to register for the CTBA general election. Looking further into this, it turns out Kao is on the ballot for the independent director position. Furthermore, upon examining the master-list of all 1650 registered voters. 1471 are new members of the organisation, and 995 out of this 1471 newly registered member shared the same 15 email address. You do not need to be the world greatest detective to come to the conclusion that this so-called CTBA general election is rigged since day one. Just how obvious is the vote allocation in this election? Let’s take a look at the vote distribution in the independent director category. All the CTBC affiliated directors received almost the same amount of votes.